A couple of years ago, a condo was being built in downtown Portland - because we, apparently, can't get enough condos. The striking thing about this particular one was that somehow, I ended up looking at it a lot (it was centrally located to my life) and that for a while, at least, it was bright blue. Although it took me a while to figure it out, it was because the construction crews were using sheets of blue plastic to protect all the windows, and because modern skyscrapers are essentially nothing but windows, that turned the whole thing blue. And it was awesome - until the building opened and now there's another metal and glass structure hanging out in the skyline. I have to admit that we can do some pretty interesting things with steel and glass - very awe inspiring in their starkness. But at the same time, we can do other equally interesting things with a whole lot of other materials and (gasp) colors. And I'm getting tired of seeing nothing but starkness. But are there interesting things that can be done to skyscrapers that are more than just aesthetic? I saw an example in Vancouver BC a long time ago - I have no idea what the building is called, but googling "tree building vancouver" brought up this picture of it - and I think it looks pretty, even though the tree itself is just a little tacked on. And, it could be argued, that despite shade in summer (but not winter) and a modest carbon dioxide-oxygen exchange, that one tree doesn't actually do a whole lot. And it's sort of right; but at the same time, there's also a psychological value in it, isn't there? To me, it's comforting - we don't have to give up everything that we know to live under a tree. There are other ways to do it, though - instead of building stark and boxy and trying to tack on renewable energy, like I think we need to, the entire building can be designed around wind energy. 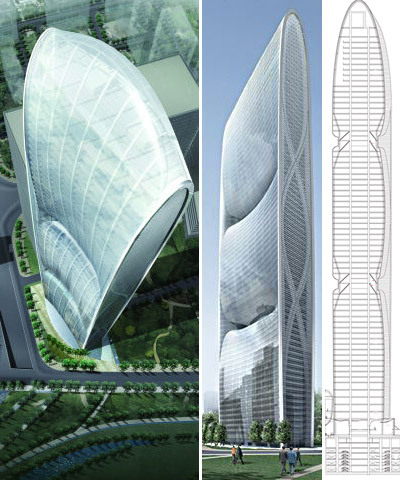 This example, of the Pearl River Tower - website here - is a good one not only because it's being built, but it's also being designed to generate more electricity than it requires to operate. Will it do so? That's up to them, most likely - but the really cool point is that even now, before widespread adoption and any sort of focus on renewables, buildings are starting to be able to promise more energy than they consume. And I think that's incredibly important. Are we ready to know down all of our buildings and put up renewable energy factories? No. And we probably shouldn't. But the fact exists that it's getting more and more possible every day - new buildings can be built better, both to conserve and to generate electricity, and older buildings can be retrofitted. In fact, it was just announced that several organizations, among them the Rocky Mountain Institute, will be retrofitting the Empire State Building to LEED Gold standards - meaning they'll cut power usage by 38%, among other things - by 2013. Sweet. It's definitely possible. But at the same time, it's also easier to toss up another high-rise of condos. Sooner or later, though, that's not going to be enough. The only real difference between these awesome, useful things and the standard buildings that are (or were) getting built all the time is the intelligence behind their design. It doesn't cost that much more money to design and build well - and it often gets recouped in lower operating expenses - but it requires talent. We need to make sure we're training that talent.